The Bhagavad Gita, perhaps the most famous of all Indian scriptures, is universally regarded as one of the world’s spiritual and literary masterpieces. Richard Davis tells the story of this venerable and enduring book, from its origins in ancient India to its reception today as a spiritual classic that has been translated into more than seventy-five languages. The Gita opens on the eve of a mighty battle, when the warrior Arjuna is overwhelmed by despair and refuses to fight. He turns to his charioteer, Krishna, who counsels him on why he must. 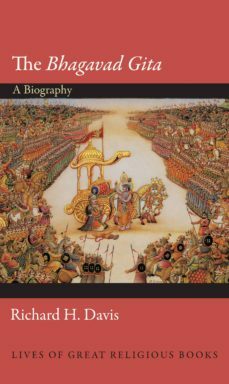 In the dialogue that follows, Arjuna comes to realize that the true battle is for his own soul.Davis highlights the place of this legendary dialogue in classical Indian culture, and then examines how it has lived on in diverse settings and contexts. He looks at the medieval devotional traditions surrounding the divine character of Krishna and traces how the Gita traveled from India to the West, where it found admirers in such figures as Ralph Waldo Emerson, Henry David Thoreau, J. Robert Oppenheimer, and Aldous Huxley. Davis explores how Indian nationalists like Mahatma Gandhi and Swami Vivekananda used the Gita in their fight against colonial rule, and how contemporary interpreters reanimate and perform this classical work for audiences today.An essential biography of a timeless masterpiece, this book is an ideal introduction to the Gita and its insights into the struggle for self-mastery that we all must wage.